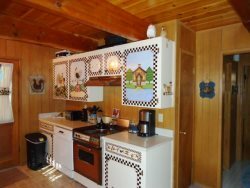 Dun Wurkin` Cabin - Great location with level, easy walk to town. A stay in a Twain Harte Rentals vacation cabin is a wonderful opportunity to be minutes from popular snow sports. Both Dodge Ridge Ski Area and Leland Snow Play are just up the mountain at about 6300 foot elevations. These wonderful Tuolumne County facilities are 3 hours from the Bay Area, 2 hours from the Central Valley, and 30 minutes from Twain Harte Rentals vacation cabins. Both are easily accessible from Highway 108. There’s nothing like playing in the snow at Leland Meadows. The pristine alpine setting presents another softer world of well-groomed snow. Visitors enjoy snow tubing across 12 acres of the “Biggest & Best Snow Play Facility in the Sierra.” Leland Snow play is open from the first snowfall to the middle of April. Leland Snow Play offers individual rates ($13-$32 per day) and group rates by reservation for a minimum of 15 snow players. Tubers can hike or ride the tow lift up the hills to slide down one of many lanes – “mild to wild.” Families and friends can ride down side-by-side lanes. Small children also enjoy groomed kiddie hills, climbing the snow mounds, building snowmen, and playing in the snow. Two or three people may ride together on the kiddie hill. Children ages 5-12 (110 pounds max) can participate in miniature snowmobiling. Directions: From Twain Harte Rentals vacation cabins, take Highway 108 east toward the Sonora Pass. Four miles past Strawberry, turn right onto Leland Meadows Road and continue to miles to 34033 Leland Meadow Road, Strawberry, CA 95375. All generations enjoy happy memories of skiing and snowboarding at the Dodge Ridge Wintersports Area/Dodge Ridge Ski Area. Located near Pinecrest, the facility opens when enough snow has accumulated. From the base at 6600-foot elevations to the peak at 8200 feet, Dodge Ridge features 860 acres accessible via 12 lifts. SleddingDodge Ridge operates a retail sporting good shop, equipment rentals, and many programs. Tickets are available for half days, full days, season tickets, and are priced by age. From Twain Harte, take Highway 108 east to Pinecrest Lake Road and turn right. Continue about 3 blocks and turn right on Dodge Ridge Road. Continue 3 miles.